Mr Gasket 9703G - TH350 Dipstick 29-3/4"
You can have unlimited flexibility Lokar's PTFE-lined Flexible Braided Stainless Transmission Dipstick. 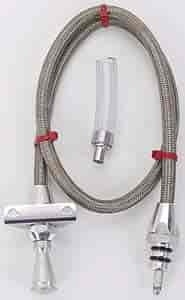 Kit comes complete with braided stainless steel outer housing and heat resistant E-Z to read flexible inner dipstick measuring cable. Inner cable is stamped with appropriate trans fluid levels. Machined aluminum handle and aluminum fittings compliment Lokar's flexible engine dipsticks. Kit includes dipstick funnel adapter to assist in filling. Designed for ''push in'' style transmissions (except the C-4 Pan Fill dipstick, it is a screw-in type). Dipstick seals with O-rings. Applications available for GM, Ford, and Chrysler transmissions in both firewall mount and transmount. Firewall mount measures 24'' in length unless noted otherwise. Transmount mounts to the bell housing and the length varies according to the transmission application. Kit comes complete with installation instructions. Note: C-4 Pan application is a ''screw-in'' style. Call for information on custom lengths and applications. Does Lokar TD-3350400FM fit your vehicle? TD-3350400FM is rated 4.7 out of 5 by 3. Rated 5 out of 5 by Jk55 from Great looking dipstick. This looks good and fits in with what I am doing to the engine compartment of my 55 chevy. Rated 5 out of 5 by 66 Nova SS from Great Quality and Fit. This is a great Lokar product. Easy to install, fit perfect and looks good. Rated 4 out of 5 by itiswhatitis from made my day Installed it on my car, and it has been worth every cent.! !